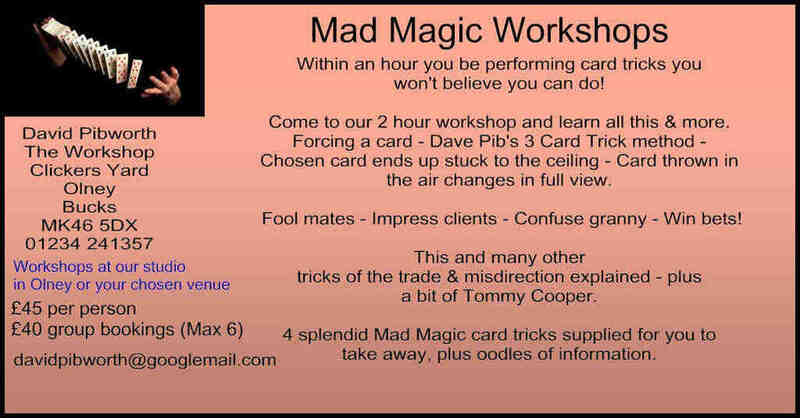 Mix & Mingle, workshops and a magic website. It's going to be another busy week. I've been to the Arts Gateway Mix and Mingle before, but just as a wanderer, saying hello to people I know. But this time, I thought I'd take a table there with some magic. I'm not quite sure if my new website www.magicandmore.co.uk will be up and running by then, but in any case, I thought I'd get amongst the public, do a bit of magic and drink plenty of tea. Then on Friday I travel to Cardiff to teach it at the Pauline Quirke Academy, where I do a series of workshops on the Saturday starting at 9 and ending at about 5. They like me at Pauline Quirke's academies as I suddenly set things on fire (under very controlled circumstances I should add) and always end up with the cutting off my arm with a knife for the older students. In between, I'm teaching them how to make things disappear and end up somewhere else and all the misdirection that goes with it. I'm also getting my own channel on YouTube as I do video demo's and I'm busy uploading my vids onto that. Some of them are quite old, and so I'm getting around to re-filming them with better angles and quality. If you want a look at any then they're under David Pibworth Productions, and at present you will see in some cases a much younger me doing them, but the gags are much the same. Here's one not uploaded yet which is the knife through the arm. One of the reasons it's not on yet is that I'm having difficulty sourcing the knives, but I know people seem to enjoy it, so here it is. I've got to nip in and out this week putting a few stages into various venues see www.stage-trailer.org.uk for details. We're currently having the large mobile stage refurbished which is something I'd been putting off for a year or so, but then a tree went and fell on it during the recent storms which rather put me in the position of needing to do it. "So, see you tomorrow if you're at the Arts Gateway event." I'm the one with a hat on, and I shall have the Magic Colouring Books with me, as used by Eddie Redmayne on the Graham Norton show if you want one. Special offer as well!